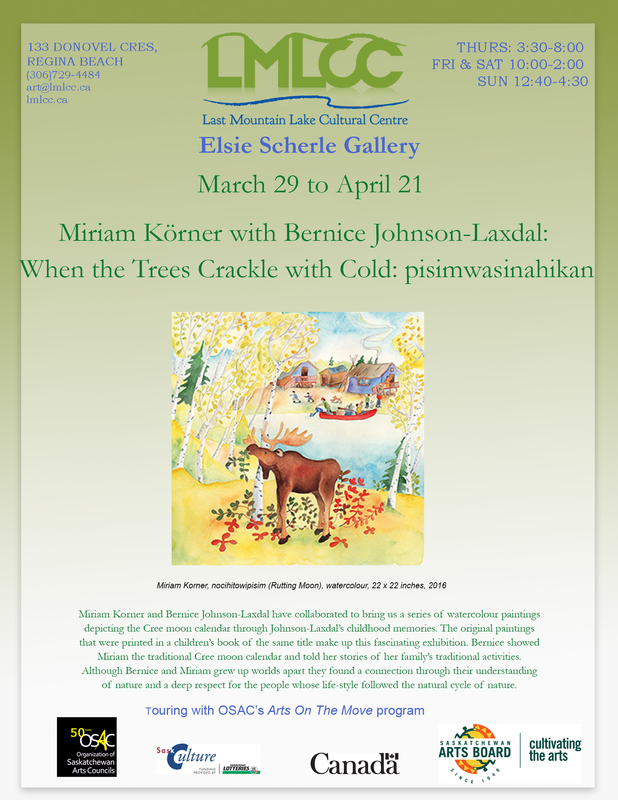 So much is happening at the Elsie Scherle Gallery! Touring and local exhibitions, music and fellowship, presentations and programs galore! Take some time to tour around and check what's coming up next! Continuous is a multi-sensory art installation by Monique Martin augmented by the scent of beeswax and the sound of buzzing bees that comments on the steady decline in honeybee populations and the devastating effects of their collapsed colonies. Through ceiling-suspended panels and a participatory hive wall, the artist creates an interactive experience where visitors are immersed in a “live” beehive. Martin seeks to illustrate the delicate nature of what happens in a hive as it relates to the interactions of humans: The more we are involved, the more the bees suffer. Miriam Korner and Bernice Johnson-Laxdal have collaborated to bring us a series of water colour paintings depicting the Cree moon calendar through Johnson-Laxdal's childhood memories. The original paintings that were printed in a children's book of the same title make up this fascinating exhibition. Touring with OSAC's Art on the Move program. Showcasing the work created over the past year by our communities' budding artists. The LMLCC's Youth Multimedia Art Program is in its 10th year, and the Children's Multimedia Art Program is in its 7th year! These classes allow the children to experiment with many different art mediums, including paint, clay, fibre, animation, and more!